This is the lock (bandha) which controls the nadis (psychic passageways) and nerves and blood vessels that flow through the neck to the brain. Jalandhara Bandha is concerned with the upper Chakras, like Ajna and Bindu. Suggested benefits from the Practice ~ Regulating circulatory and respiratory systems; decreased heart rate; increased breathing capacity; introversion; one-pointedness; balance of thyroid. Start any practice of Bandha with very few repetitions. Stay with these few repetitions consistently for a while, being regular, before building up to any increase. Monitor the sensations and energy in the body and do not cause aggravation. Do not be ambitious. Even a few rounds of any Bandha may be sufficient for some constitutions. This practice is done here on internal breath retention, although at other times external breath retention may be used. Sit in a comfortable cross-legged position, knees coming down towards or to the ground. If the knees do not approach the ground, prop your backside up with a higher cushion. The spine should be erect and stable and comfortable. Hands rest on thighs. Close the eyes and stabilise. Breathe calmly. Relax. hunch shoulders slightly upwards and forwards. Hold this position with the breath held COMFORTABLY within. DO NOT STRAIN. Count the seconds with the heartbeat. When ready to exhale, slowly straighten neck first, raise head, drop shoulders, release arm locks and then exhale. Keep eyes closed. Let breath and body settle completely. Neither exhale nor inhale AS YOU MOVE the neck, hold breath where it is until end of movement. When ready, repeat a couple of times, working slowly over time towards five repetitions. After your body has adjusted over plenty of time, you may practise ten if you need. 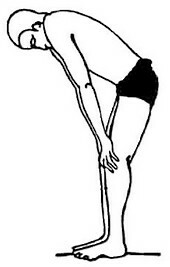 If you cannot sit cross-legged, do this practice standing as so…. Do not practice if you have blood pressure problems, heart ailments or inter-cranial pressure. I will post later about some of the rationale and the uses of this practice and the other Bandhas, like Moola Bandha (the Root Look) andUddiyana Bandha (the Abdominal Lock).